When U2 kick off their 360° Tour tonight in Barcelona, Spain, they'll do so under a unique, specially designed stage set called The Claw. With no defined front or back, the band will be surrounded on all sides by the audience. The stage design will also include a massive cylindrical video screen that will allow viewers an unobstructed view of the band from any seat in the house. But if you're looking for the usual banks of speakers common to every stage set - fuggedaboudit. With The Claw, all of the technical hardware is hidden inside the four legs of the bizarre-looking contraption. 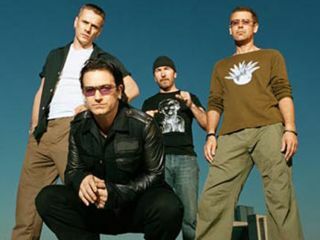 The idea of The Claw was Bono's idea, and he admits he's been working on the concept even before U2's last outing in 2004-05. "The Claw is all to do with how you can play outdoors without using a proscenium stage with a big bank of speakers on the left and right," he said in a recent interview. "Every outdoor stage show you've ever seen uses that configuration. This idea we're now working on will mean more people can fit into the shows, there will be better sight lines and everyone will be closer to the action." It is estimated The Claw's design will open up an additional 20,000 seats per stadium - practically ensuring U2 a shot at breaking box-office records for this run. Not one Claw but three! And get this: there's more than one Claw. In fact, there's three of them. Each steel structure measures 164 feet high and requires 180 trucks to transport it from venue to venue. The reason for multiple stages is that while U2 are playing in one city, a second one is being erected at another venue while a third is being transported yet somewhere else. Pretty crafty. But hey, at least it's not a giant lemon! And if you want to view a video demonstration of what you might be seeing on tour, click here.